This is how I did this. I only use Picasa3, so I'm not very sophisticated. I used the Focal Black and White feature to keep the daylilies yellow, then I used the Color Temperature part of the Tuning feature, several times, to get the sepia tones on the B&W. Oh so pretty! The lilies are a very nice touch! I agree that the flowers are a nice touch...it is a classy photo. How did you do that, Jan? It's very nice!! 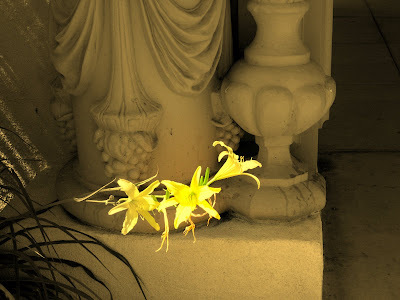 I like how you have coloured the lilies but left the rest in sepia. Very nice!! This is lovely indeed Jan! The lighting is wonderful as well. sure looks sophisticated to me! Very nice. I love the way the flowers look in this.